Vaporesso Swag 80w Starter Kit from Ave40 (20% Off Coupon Inside!) - Daily Vaping Deals & The Best Vape Product Reviews at Vaping Cheap! 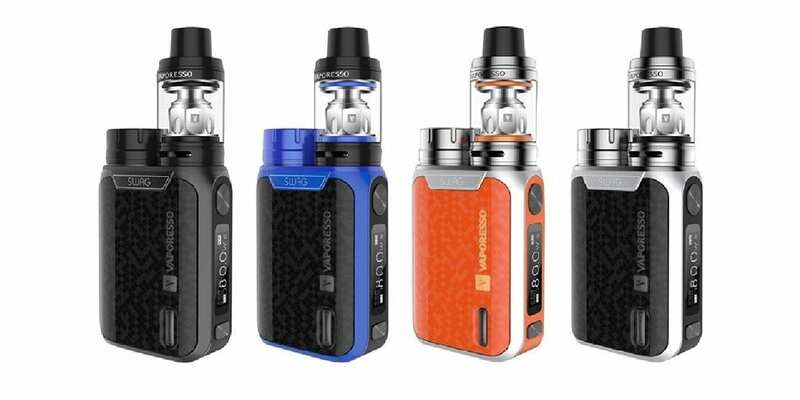 The Vaporesso Swag 80w Starter Kit from Ave40 is available in multiple different color options such as Silver, Blue, Black and Orange. This vape starter kit does include the new Vaporesso Swag 80w TC Box Mod and the NRG SE Tank. What’s great about this vape kit is that there are two versions available, one with a 3.5ml e-liquid capacity, and the other with a 2ml e-liquid capacity, which makes it TPD compliant! Click Here to Check Out the Vaporesso Swag 80w Starter Kit! Use Coupon Code DEALNB1R for 20% off! The included Vaporesso Swag 80w TC Box Mod that’s included with this starter kit does require a single high drain 18650 battery for operation. This device does have a maximum wattage output of 80w and is powered by the Omni 20.0 chip, which was last seen in the Vaporesso Revenger. Even though it’s not exactly the same chipset, you can expect a similar performance, which is great since this chipset is well known for its excellent performance. Since being powered by the Omni 2.0 chipset, this device has multiple functions such as variable wattage, CCW, CCT, temperature control mode for Ni200, Ti and SS wires, RTC and a Bypass mode, which essentially turns this vape mod into a mechanical device. The Vaporesso Swag does also feature an IML injection coating, which was designed for greater wear resistance especially when compared to the typical spray painting or pad-printing. This ensures an excellent quality mod, better quality graphics and resistance to fingerprints. The Vaporesso Swag 80w does feature a unique top battery cap design, which is new to the Vaporesso line of mods. This makes battery installs incredibly easy and quick. The minimum firing resistance of this device in temperature control mode is 0.05 ohm, and in variable wattage mode 0.1 ohm. In addition, it is firmware upgradeable and has 2A charging via micro USB, so you can quickly charge your battery and be back to vaping in no time. However, we do recommend to use an external battery charger when charging your vape batteries. Another great feature of the Vaporesso Swag Box Mod is its compact design, which makes it easy to carry with you everyday. With the included tank installed, it only weight 99g, so you can easily store it in your bag or pocket on the go. This device also features an ergonomic design, and when matched with its compactness, it makes it incredibly comfortable to hold and use. The Vaporesso NRG SE Tank is one of the newest sub ohm tanks coming from Vaporesso and it’s meant to compete with the ever so popular Smok TFV8. It is primarily constructed of stainless steel and Pyrex glass. In addition, this atomizer sports an overall base diameter of 22mm, so it’ll look great on the Swag 80w TC Box Mod. Depending on which version you choose, you’ll have a 3.5ml or 2ml e-juice capacity. However, both versions of this tank features a simple twist and fill top fill system, which was designed for simplicity. The Vaporesso NRG SE Tank is compatible with the GT Core Coil System, and this vape starter kit does include the GT2 Core (pre-installed), and an additional GT CCELL coil. The CT CCELL coil has a resistance of 0.5 ohm, and has ceramic wicking, so you’ll be getting excellent flavor. This coil is rated up to 40w. The pre-installed GT2 Core has a resistance of 0.4 ohm, and is rated between 40w and 80w, so you won’t be needing a ton of power to get a satisfying vape experience. The SE in the name of this tank does stand for “Special Edition”. This sub ohm tank features fully adjustable bottom airflow, and can easily be adjusted by simply twisting the airflow control. This vape starter kit also includes a replacement glass tank section, a user manual, and a Vaporesso USB cable. It’s definitely a pro that this kit includes an extra spare glass tube, so if you break or lose the original, you have one to go back to! All in all, the Vaporesso Swag 80w Starter Kit from Ave40 is an excellent vape starter kit for an affordable price. If you’re looking for a unique vape kit that offers tons of different features, and comes with almost everything you need to start vaping, then this is certainly a vape starter kit to consider!